The first flowers are a rich orange. Must bee the season of the witch! Later in the season the petals are yellow with reddish calyxes. They are quite the most unusual orange/yellow/reddish colored flowers with four, just four, crepe paper streaming petals that furl and unfurl with the days temperatures. They smell of vanilla and on warm days perfume the garden. I planted them for the fragrance. When you smell them, you will, too. It's no accident that most winter blooming plants have some fragrance...Nature had to insure that insect pollinators could easily find their way to a plant that blooms when most of the garden is fast asleep. Those lucky enough to catch a pollinator visiting in the deep of winter describe seeing small flies and gnats...perhaps, even hoverflies. On really warm days there might be honeybees or even a few bumbles about. But, this morning it was 30F and, trust me, there wasn't a bee or fly anywhere to be seen. The flowers were unfurling in the sunshine and they smelled delicious. They seem to be saying, "Hello pollinators, I am ready for you!" You might well wonder how the flowers of Witch-hazel get pollinated if insects don't happen to be around? I'm glad you asked! They cleverly flower for months and months, giving flies, bees and other pollinators plenty of time to find the fragrant flowers. If that's not enough, they appear to be able to self pollinate. But, sometimes, even a long bloom period and self pollination isn't enough. In my garden, fruit set on the H vernalis is low. There was one seed capsule on three good sized shrubs. But, I'm not worried; they are marvelous colonizers and I will never run out of witch hazel and that wonderful fragrance on warm winter days. Now clever Mother Nature, would you please have a chat with Old Man Winter and let him know that gardeners all around the blogasphere really need a break. Thank you. Keep planting for the pollinators! Labels: H vernalis, witch hazels. Beautiful!! I was just out this weekend taking photos of my witch hazel which is bursting into bloom. I am looking forward to reading your posts about pollinators as I garden for pollinators too. Excellent photos! I must get a witch for my gardens. I love all of the soft looking hairs. Looks like it keeps the blooms warm. AND if you get a memo from Mother Nature's chat with Ole Man Winter, do let us know! Those warm colors brighten the day and I can almost, almost smell that sweet fragrance. I have a native witch hazel which blooms in the fall. Not as stunning since the leaves are still on the plant but still, lovely blooms. I drool over these plants every time I see them. Gail, thank you for these lovely photographs. 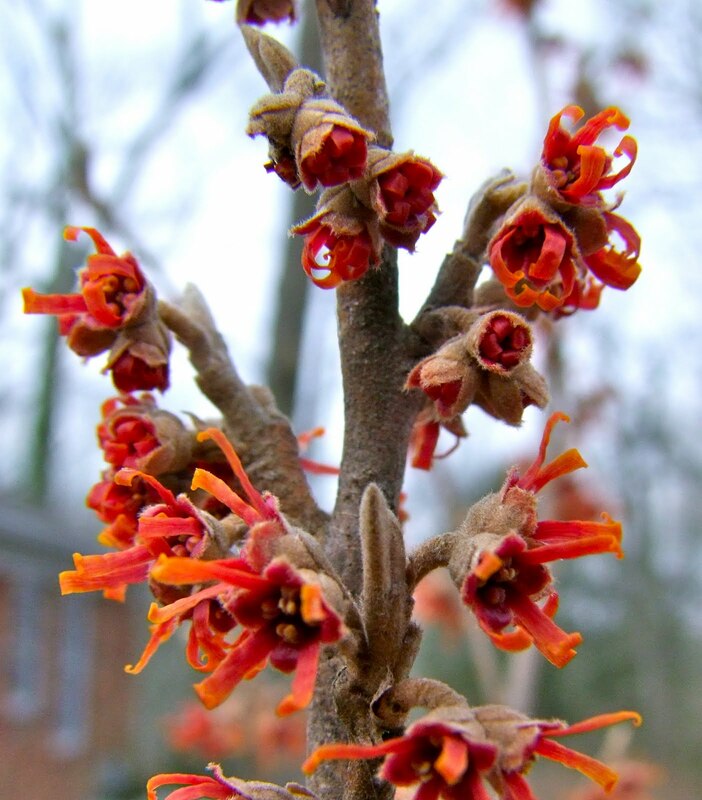 I absolutely adore witchhazel and when I lived on the west coast spring flowering varities were common. Last spring I planted a native eastern witchhazel but to my surpise these bloom in the fall so I will have to wait for quite some time to see if it will produce any blooms. Hi Gail....I agree the fragrance is wonderful and the blooms a gift to the eyes. Sadly, I cannot grow them here....they are rabbit fodder. I planted three shrubs several years ago.....they are no more. Nice! I hold to experience the fragrance once my sinuses clear. Our witch hazel just started blooming today for the first time! I hope you're enjoying the fragrance for all of us. Great post on all the different Hamamelis, we only have one native in the north and it blooms in November. I hope you see some bees in the coming weeks as the days get longer. 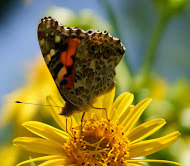 Gail, I am so enjoying this series on pollinators! Great job :) Your Witch is stunning, and I can't wait for mine to bloom. Right now it's still buried under snow. Posts about witch hazels are so tantalizing - the 'Diane' witch hazel I planted last year is still buried under more than two feet of snow. I am not worried about the snow but about last year's dry weather - will 'Diane' have survived? Oh I can see that I must plant some Witch Hazel... the blooms are captivating. I, too am enjoying your series. Delightful! ummmm - lovely, you have some great varieties there Gail. Witch Hazel has the most heavenly fragrance. I saw a Hoverfly out the other day with the Honeybees but forget about getting a picture! I'd love to know how fast they can fly around. What gorgeous photos! I'm a huge witch hazel fan but don't see them much here in California. I am drooling over yours. Loved the pollination info, too - it's so interesting to me the many ways plants use to accomplish this. Hadn't thought about the long bloom time - duh! Gail perhaps the Hamamelis vernalis is a sign that the worst of winter's hold has passed! Let hope so. We had a few days of freeze here in AZ last week but now the warmth of 70F is enjoyed by us all..sending warm rays your way! Wow, these are stunning. I must get more witch hazels. A lovely post, dear Gail. Since I don't have these beauties in my garden, it's pure delight to visit yours, you lucky gal! What gorgeous plants. I have a hammamelis mollis Pallida but have been yearning for some more and your post I must say hasn't helped! In fact I think I might just give in and have another one, or more. Lovely. Our native witch hazels are wonderful (and their Asian relatives are pretty cool, too) -- great post! Wow Gail, did you get a new macro lens? These are fantastic photos! How's the overall shape of witch hazels? I was contemplating getting one, but it has to be a nice shape because of where it would be going. btw, happy (late) blogaversary! Good Morning Gail, I think you mentioned you were three years old as a blogger yesterday!! You are like an older sister . . . though in age I believe I top you. 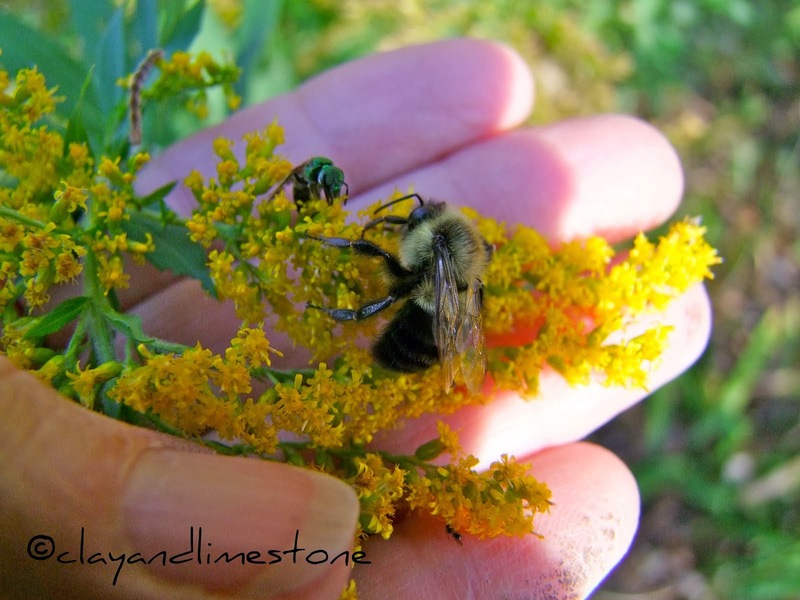 ;>)) I love your blog and native plant and bee supportive posts are very important. I am enjoying Donavan . . . I have your link open on another page. Your Witch Hazels are so lovely . . . At least you have some beautiful life unfurling in your garden. We are buried in snow and deep cold here. This has been a true winter for us and all over . . . though I do recall worst twenty years and more ago. Happy Blog Birthday to you!! What lovely cheery blooms for the dead of winter! I'm amazed you have any pollinators about right now; we certainly don't, but I'm glad because they'd surely freeze in this frigid weather. I hope Mother Nature listens to your request. How wonderful having blooms in the garden this time of the year Gail! I have just bought a hybrid Hamamelis. I have always wondered why they have such narrow petals. I have read that the petals curl and uncurl in very cold weather so perhaps that is the answer for their odd flower shape. They are so unique and I wish I had space for more. I love Witch Hazel! I remember coming to your blog and appreciating that flowers some days ago on your another post. And its again a pleasure to know about them throughly this time. Oh wow, spring. How beautiful. We're still covered in ice and snow here in northeast Kansas. Thanks for brightening my day. Do you know I have never seen a witch hazel in real life? I am jealous of all of them I see on other blogs! Yours is gorgeous! Hi Gail, When will Bill and Google get that smell-o-meter up and running? The only thing I can think of to improve on your fabulous photos is to smell them too.